Using the Vocabulary Planning Document to Select Vocabulary for Interactive Word Walls. Selecting vocabulary for science lessons is a challenge. I recommend using the Vocabulary Planning Document to ensure that the vocabulary selection process is focused and systematic. 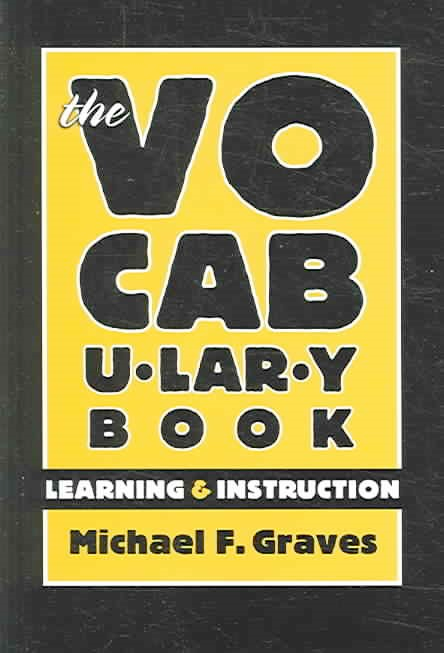 The Vocabulary Planning Document is completed during team planning and the vocabulary included on this document determines the selection of all instructional materials and the organization of interactive word walls. This robust vocabulary-driven process focuses team meetings and ensures that lessons and lesson materials are aligned to science standards with fidelity. I refer to a completed Vocabulary Planning Document as a “shopping list.” We all know what happens when we go to the grocery store without a shopping list. We buy things we don’t need, that are convenient – already made, that look good, but are not healthy or budget friendly. The same thing happens when we look for lesson materials – go shopping – without a shopping list. We select activities that look good, that are convenient – already made, but might not align with our grade level science standard. If lesson materials do not contain vocabulary included on the Vocabulary Planning Document – the “shopping list,” grade level teams add the vocabulary words to their lessons. Then they locate or create materials to support teaching the term/science concept. If available lesson materials contain vocabulary not listed on the Vocabulary Planning Document, grade level teams decide if the additional vocabulary is fully aligned with the science standard. If it is aligned, the word is added to the Vocabulary Planning Document and it will be included in lessons. If it is not aligned, it will not be added to lessons and lesson materials that teach this vocabulary word/science concept will NOT be used. 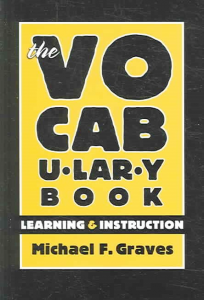 Dr. Michael Graves has written two books (The Vocabulary Book, Teaching Vocabulary to English Language Learners) that explain the four components of a comprehensive vocabulary program: teach a few well-selected words, teach word-learning strategies, foster word consciousness, and provide rich and varied language experiences. 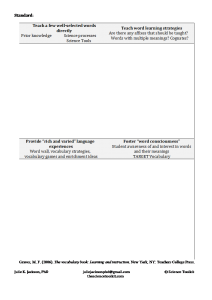 The Vocabulary Planning Document provides a structure that ensures teachers consider the four components of a comprehensive vocabulary program when selecting lesson or unit vocabulary. All vocabulary decisions are driven by state science standards. Teachers review their assigned standard and consider the rigor, depth of knowledge of the verbs, and science process skills associated with the concept. They review the standards vertically to determine the science concepts that students need to know, what concepts they already know, and what they will learn in the future. Finally, they consider the science tools their students will use during inquiry science activities. 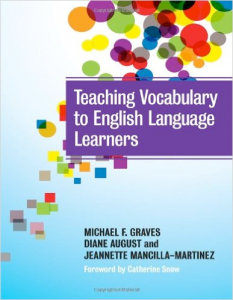 The results of this review are included on the Vocabulary Planning Document under the heading “Teach a few well-selected words directly.” Words learned in previous grades, science process skills, science tools, and safety considerations are pre-taught via direct instruction. Next, they consider word-learning strategies. They review the science standard looking for any affixes that should be taught or reviewed. Using word parts to help unlock the meaning of unknown words is a widely accepted practice. In fact, one study found that teaching a set of 20 prefixes and 14 roots, and knowing how to use them, unlocked the meaning of over 100,000 words. The reference for this study and a list of common prefixes and suffixes is available at readingfirst.virginia.edu. We also look for words with multiple meanings. Many familiar words have context dependent meanings. For example, to rotate, spin on an axis, does not describe rotating or moving stations or activities in a classroom. The more frequent the word, the more likely it is to have multiple meanings. In fact, some words have over 100 meanings. A poster of the top 10 English words with their multiple meanings can be found at Englishwithatwist.com. We also look for English-Spanish cognates. Cognates are words from two different languages that have the same or similar meanings, spellings, and sometimes, similar pronunciations. English-Spanish science cognates are words that share the same Latin or Greek roots. Then, we consider ways to foster word consciousness. We select the target vocabulary that MUST be included on the interactive word wall and structure ways that students might become aware of and interested in these words and their meanings. Finally, we plan for ways to provide rich and varied language experiences. Teachers sketch and plan the interactive word wall making sure that all target vocabulary is included on the wall and will be experienced during inquiry science activities. The sketch often resembles a graphic organizer and may include verbs from the science standard and science process skills. Interactive word walls are built during the “explain” section of a 5-E lesson plan. Examples of completed interactive word walls are available at the Science Toolkit Facebook page. Welcome to The Science Toolkit!